Aloha Airlines was an American airline headquartered in Honolulu CDP, City and County of Honolulu, Hawaii, operating from a hub at Honolulu International Airport. Operations began on July 26, 1946, and ceased on March 31, 2008. The airline was founded as charter carrier Trans-Pacific Airlines by publisher Ruddy Tongg as a competitor to Hawaiian Airlines, commencing operations on July 26, 1946, with a single World War II-surplus Douglas C-47 (DC-3) on a flight from Honolulu to Maui and Hilo. The name reflected Tongg's vision of a trans-oceanic airline connecting California, Hawaii, and China. It soon earned the nickname "The Aloha Airline" and was flying four aircraft by the end of the year. Approval to operate as a scheduled airline came when President Harry S. Truman signed the certificate on February 21, 1949, with the first scheduled flight on June 6, 1949, following ceremonies held the previous day. In 1952, the airline reported its first annual profit: $36,410.12. The airline's market share rose to 30% that year, up from 10% in 1950, the year the airline adopted the name TPA-The Aloha Airline. However, the introduction of the Convair 340 at Hawaiian Airlines halted further growth of TPA's market share for over five years. In 1958, real estate developer Hung Wo Ching, whose family held a sizable stake in the airline and following overtures by Tongg, was elected president of the airline. 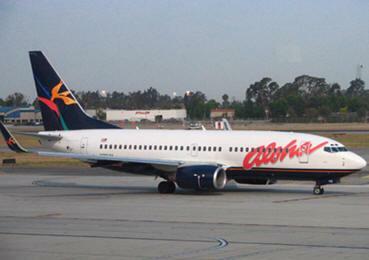 In November of that year, the company changed its name again, becoming Aloha Airlines. On April 15, 1959, Aloha took delivery of its first Fairchild F-27 turboprop aircraft. These aircraft were unique to Aloha, built with a stronger keel beam and thicker belly skin to satisfy concerns about ditching the high-wing aircraft. That summer, Aloha's market share jumped to 42%. Rising costs and an economic retraction in Japan put Aloha into a defensive position in the early 2000s, soon exacerbated by the September 11, 2001 terrorist attacks, the SARS panic of 2003, and soaring fuel prices. On December 30, 2004, Aloha Airlines filed for Chapter 11 bankruptcy protection in an attempt to cut costs and remain competitive with other airlines serving Hawaii. Following approval of new labor contracts and securing additional investment from new investors, the airline emerged from bankruptcy protection on February 17, 2006. On August 30, 2006, Gordon Bethune was named Chairman of the Board. Citing losses from a protracted fare war incited by inter-island competitor go! (operated by parent company Mesa Airlines) and high fuel prices, Aloha filed for Chapter 11 bankruptcy protection again on March 20, 2008. Ten days later, on March 30, 2008, Aloha Airlines announced the suspension of all scheduled passenger flights, with the final day of operation to be March 31, 2008. The shutdown resulted in the layoffs of about 1,900 of the company's roughly 3,500 employees. Hawaii Governor Linda Lingle asked the bankruptcy court involved to delay the shutdown of Aloha Airlines passenger services, and forcibly restore passenger service; however, federal Bankruptcy Judge Lloyd King declined, saying the court should not interfere with business decisions. After the shutdown of passenger operations, Aloha and its creditors sought to auction off its profitable cargo and contract services division. Pacific Air Cargo emerged as the highest bidder for the contract services division; the sale of the division to Pacific Air Cargo is currently in progress. Pacific Air Cargo will operate the division under the name Aloha Contract Services. Several companies expressed interest in purchasing Aloha's cargo division, including Seattle-based Saltchuk Resources, California-based Castle & Cooke Aviation, and Hawaii-based Kahala Capital (which included Richard Ing, a minority investor in the Aloha Air Group and member of Aloha's board of directors). However, a disagreement between cargo division bidders and Aloha's primary lender, GMAC Commercial Finance, ended with the bidders dropping out of the auction. Almost immediately afterwards, GMAC halted all funding to Aloha's cargo division, forcing all cargo operations to cease; at the same time, Aloha's board of directors decided to convert its Chapter 11 bankruptcy reorganization filing into a Chapter 7 bankruptcy liquidation. Saltchuk Resources decided to renew its bid to purchase the cargo division at the urging of U.S. Senator Daniel Inouye, and a deal between Aloha and Saltchuk was struck and approved by the federal bankruptcy court, where Saltchuk would purchase the cargo division for $10.5 million. The sale was approved by federal Bankruptcy Judge Lloyd King on May 12, 2008, with the sale expected to close two days later. Prior to its bid for Aloha, Saltchuk Resources was already present in Hawaii through its subsidiaries Young Brothers/Hawaiian Tug & Barge, Hawaii Fuel Network, Maui Petroleum and Minit Stop Stores. The company also owns Northern Air Cargo, Alaska's largest cargo airline. A new subsidiary, Aeko Kula Inc., was set up by Saltchuk to operate Aloha Air Cargo.